The Minneapolis Downtown Improvement District (MDID) was in need of a tool or experiential design solution that would help facilitate and support the organization's goal of making downtown greener, cleaner, and safer. 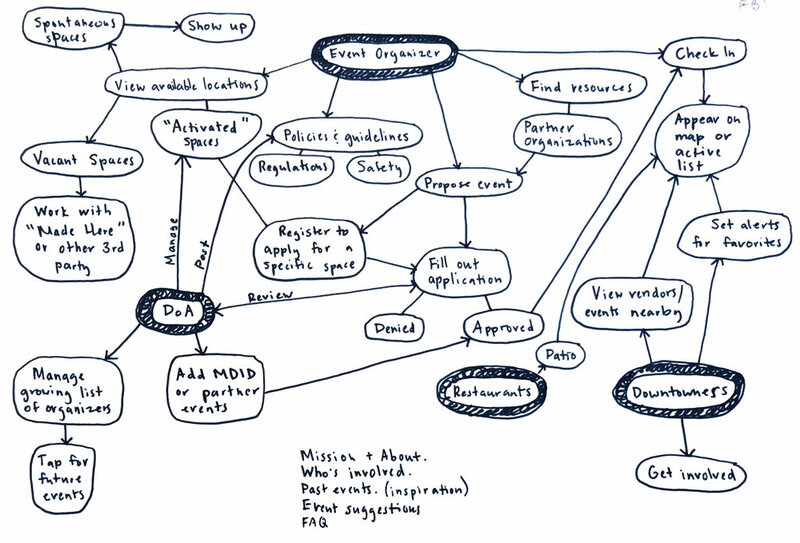 Without a narrow scope, I had the opportunity to explore problem spaces, objectives, and user groups in order to create a design that would bring value to the MDID. The MDID vaguely defined a few opportunity areas within which to work: (1) supporting the activation of Nicollet as it undergoes and reopens from construction, (2) creating a tool or plan which leverages downtown employees and volunteers, and (3) improving engagement and enhancing the awareness of MDID ambassadors. From a digital tool to a public event, any idea that would provide value in one of these problem spaces could be considered and potentially implemented with the organization's current resources. After reviewing existing research and doing some digging into similar organizations and schools of thought, I chose to focus on creating a digital tool that would facilitate the activation of Nicollet and beyond. By conducting surveys, comparative analysis, and testing features with users, I was able to design and prototype a public-facing website with a supporting activation management system. Fortunately, the MDID has conducted demographic research and perception surveys which served as a jumping off point for thinking about the problem spaces and where my solution might be most impactful. However, the data received was also skewed as the survey targeted primarily businesses and their employees downtown. Furthermore, the underlying "why" was missing entirely. 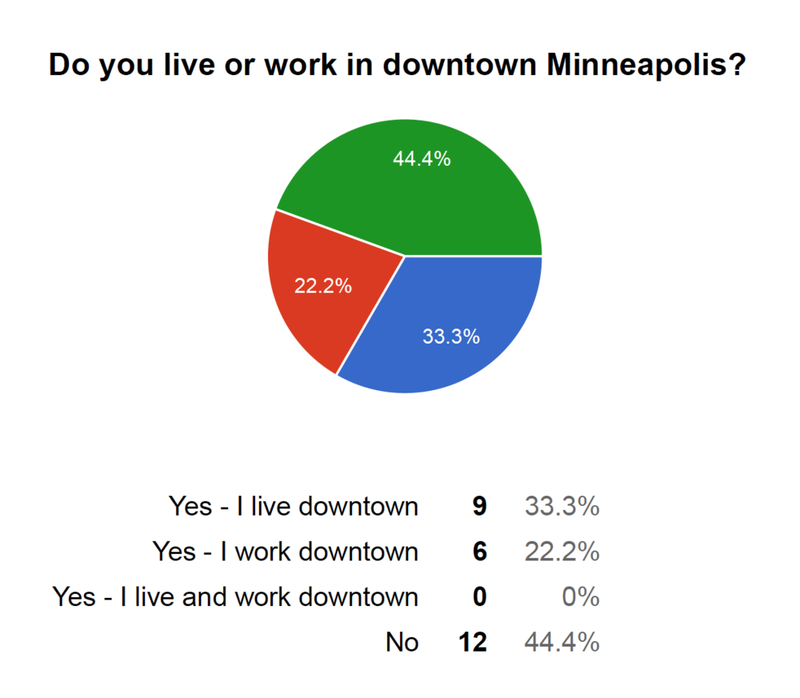 To get at a bit more qualitative data, I put together surveys to learn more about what people thought about downtown, what tools they were using to learn about downtown, and what they may want to see in the future downtown. Key insights resulting from these surveys and user interviews revealed that people working, living, and visiting Minneapolis feel safer and more satisfied when downtown is activated (an insight previously validated by the MDID), and that they additionally wanted to play a more proactive role in creating that vibrancy. 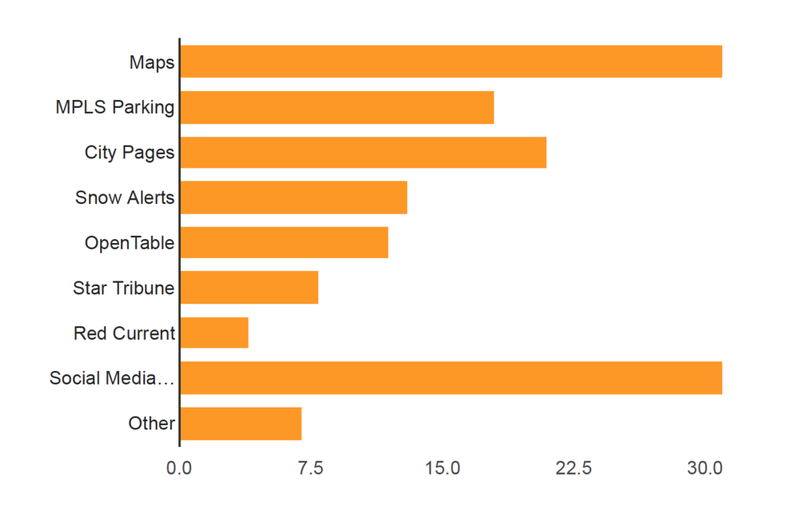 In addition to these survey results, I also spent time seeking out and synthesizing various city and MDID reports that shed additional light on activation downtown. "People are in favor of more street performance"
"Performers want to have continued access to safe, unpermitted places to perform"
"Bringing and intentional community building or even tactical approach to performing"
"Downtown property owners are becoming more engaged in activating the public realm surrounding their property"
"Programmatic busking... has been referred to as an 'unexpected delight'"
"There is a high level of confusion about what existing time, place, and manner restrictions are in place [regarding street performance]"
"[goal to] enliven and invigorate underused areas and fill in inactive sidewalks that detract from the pedestrian experience"
An inventory of public and private spaces was put together as "a resource for community members, business owners, and individuals seeking information on spaces potentially available to host events, activities, and gatherings in Downtown Minneapolis." Includes comprehensive details including location, ownership and contact information, a birds-eye map, photos, and details regarding accessibility, dimensions, structures, and amenities. Based on my initial research, I created feature cards to test with users to determine the value in what I was proposing and solidify the direction of my app. How can we leverage technology to help foster better communication between the public and various activation efforts? What I heard from users is that they wanted to know what was happening around them, and they also wanted to help create those happenings. With the Guide to Programmable Spaces resource available and the expressed need of the MDID to be able to manage activation, the idea for Spaces Minneapolis came into better focus. The application would help members of the public connect with programmable spaces while allowing the MDID to track and better support activation efforts. Facilitate the activation of downtown spaces with a digital tool. Once the problem I was solving for was explicitly defined, it became clear that the resulting application would need to exist as a web application, not a native app as my previous wireframes showed. I mapped out the different aspects of the application, including a public facing website for "activators" and an administrator dashboard that would manage activators, spaces, and events. Administrators in this application refer to to employees of the MDID or their partner organizations. Activators in this application refer to anyone looking to contribute an activity or event to the downtown experience. This could run the gamut from a musician busking on the sidewalk to a food cart to a full-blown block party. Spaces in this application are defined as literally anywhere activation could occur and is desired. This might be a large park or plaza, or a street corner that needs activity. Spaces Minneapolis is a public facing website which serves to connect the public with programmable spaces, act as an application portal, mitigate confusion about permits and guidelines, and inform the public about activation efforts. Additionally, there is a contribution aspect in which people can submit their own ideas to the MDID in consideration for future activation efforts. Explore Spaces: Leverages existing inventories of programmable spaces in an easily digestible and accessible way. This includes parks, plazas, and courtyards, alongside sidewalk areas or other unpermitted spaces suitable for street performance or micro-activities. People can apply for permitted spaces directly through the website or be connected to the appropriate application/person. Permits and Guidelines: Collects and makes searchable the various permits and guidelines around events and activation, again, in an easily digestible and accessible way. "Share an idea": Creates an opportunity for people to submit their own ideas. In my surveys, some brief ideas submitted included a bubble blowing party, sidewalk chalk, and collaborative public art. Events: As this application is intended to help the MDID manage activation, it seemed obvious to include a calendar feature to display upcoming activities and events. Research showed that people looked to various resources in finding out what was going on around them, so this feature would serve to draw people to the site and allow them to learn more about how to get involved. Activator Sign-Up: A sign-up for people interested in activation would help the MDID curate a list of people to contact with calls for proposals or requests for participation. 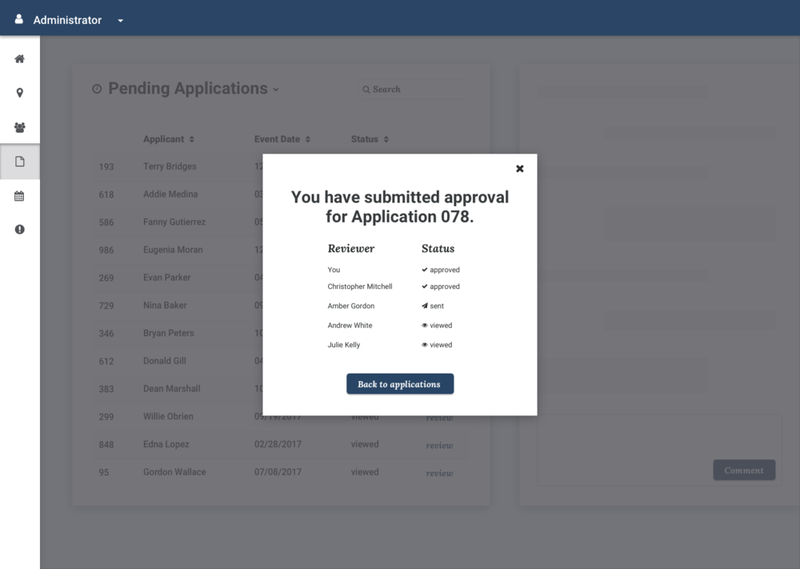 The administrator dashboard seeks to manage all of the spaces, activators, and events associated with Spaces Minneapolis, as well as allow various contributers to view and approve event applications. Additional rounds of usability testing and design iterations are necessary to make this application a truly valuable resource. Contextual inquiry into the application process would be hugely helpful to better understanding what goes on there and translating it into the digital space. A development team would also need to come on board to determine feasibility and costs associated with an application of this scale. Additional rounds of refinement to accommodate these changes would be next on the to-do list. Finally, further prototyping and testing additional interaction design, error and confirmation messages, micro-interactions and animations, and firming up the branding would create a better sense of usability and delight for potential users.